Do You Know Any Vegetarian Diabetic Meal Plan? QUESTION: I am a vegetarian and diabetic. 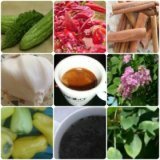 I have learned (while surfing on net) that there are certain vegetables that are excellent for diabetes, but they are very expensive, and most of them don't find fresh, only by supplements. Could you give me some suggestions on how to organize a vegetarian diabetic meal plan that my pocket can afford it? Sometimes, I organize parties with my friends and close relatives; but do not know what to cook. I am vegetarian and diabetic and others are not (they like meat). What can I cook to satisfy my veggie-diabetic needs and others at the same time? Being vegetarian is something very good, especially when you have diabetes. Eating only fruits and vegetables will provide you better control of your blood glucose level. In addition, I will mention that all the fruits on the market are something good if you have diabetes. Besides this, all the vegetables are something useful. With regards to Vegetarian Diabetic Meal Plan, there is no such diet because vegetarians are eating health foods, which can’t harm you and which can’t lead to elevated glucose level. However, you can create your own diabetic vegetarian meal plan by combining the fruits and the vegetables in a way, which you like. Anyways, the only advice, which I’m able to give you, regarding this diet, is to make yourself six separated males. In this way, you will ensure your body with constant intake of nutrients. In addition I will mentioned that it would be better for you to make yourself small dinner and to eat it at least two hours, before going to bad. Regarding your problem with the party organization, I can advise you to prepare different kinds of salad, which you like. Then after this, add small amount of salami or other type of meat, in purpose to satisfy your needs. In this way, you are not obligated to prepare something extraordinary meal, which contains meat and meanwhile your guest are going to be happy.